Server Direct Print is the function to obtain the print data from the Web server and print out the data on TM-Intelligent printer and TM printers, which are connected to the TM-Intelligent printer through Wi-Fi or Ethernet. When Server Direct Print is set to active using TMNet WebConfig, the TM-Intelligent printer sends an HTTP request to the Web server periodically, e.g. every 60 sec. If the Web server has the data to be printed, the Web server application sends the HTTP response to print. The print data should be in the ePOS-Print XML (or ePOS-Device XML) format. When printing is finished, the TM-Intelligent sends a print completion request. 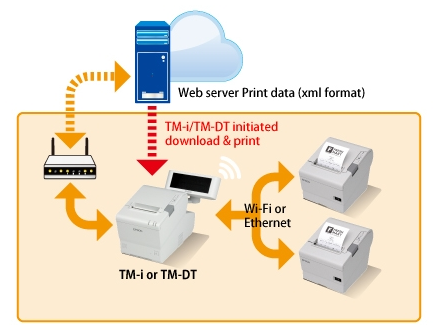 As TM-Intelligent printer supports Printer Hub function, the print data not only for the TM-Intelligent printer, but also other TM printer(s) that are connected through Wi-Fi or Ethernet is downloaded and printed at the certain printer. Using Server Direct Print, you can reduce much development, deployment, and/or support cost for POS system with Internet shopping Web site or POS system with the server on the cloud. Because you need to manage only the local printer IDs and print data at both sides. For more details, please refer to Server Direct Print User's manual, which can be downloaded at the Download page. [Note] TM-T20II-i is supported from TM-i Firmware Ver.4.3.